What do most people do during the holidays? We played many games, put puzzles together, ate too much wonderful food, read new books, caught up on every one's lives. And learned to shoot a gun!! 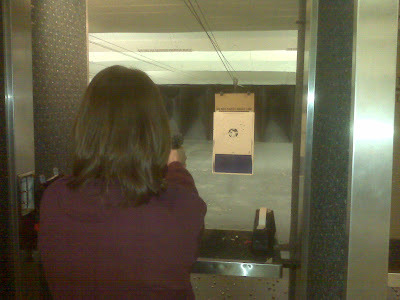 Jeff and Norm took me to the shooting range. It was very overwhelming at first. It is much louder than I thought it would be. I jumped every time someone shot something. Since we were at a shooting range that was about every two seconds. I looked like a Mexican jumping bean. I was also surprised by the raining brass. Somehow I guess I thought that the empty shells just collected neatly into a pile somewhere. They don't. They fly everywhere. It's very disconcerting to have pieces of metal flying everywhere. My men were patient with me. They let me stand there and watch for quite awhile, adjusting to the sights and sounds. Eventually I learned how to load my pistol, aim it, and fire it. I was pretty good, although the target was very close as you can see in the picture. Serious stuff, though. I have a healthy respect for guns. Hey, quite exciting to read this. I might be signing myself up for some shooting lessons soonish. Maybe we could become hard-livin' frontier women and live a life of wild abandon. What do you think?